Muscat is grown on less then 3% of the viticultural area, and this dry wine does not get the attention it deserves. While the grower struggle with inconsistent flowerings and yields, the average visitor to the area skips Muscat when visiting the producers. 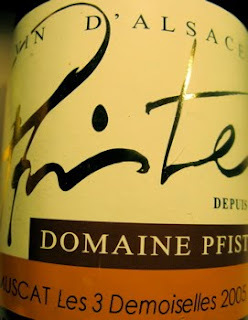 However, those of us that acknowledges that Alsace Muscat is a serious, unique, versatile, seductive, and interesting wine with loads of quality and personality, we just can't get enough of it. 2005 Muscat Les 3 Demoiselles has multi dimensional aroma where crushed grapes, kirsch, Cointreau, toffee and nuts. The taste has great definition, firmness, structure and firm acidity, while a moderate (12.5%) of alcohol is perfectly embedded. A serious wine made by a rising star. Price: €10.